Creative Intersection offers initial and ongoing SEO Assessment, and for THIS MONTH ONLY we are offering a free SEO Assessment with every KISSites business website package. 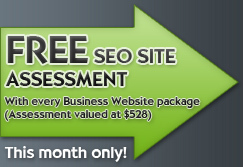 KISSites packages start from just $799 (inc GST), and the SEO Assessment is valued at $528 (inc GST) ... so this really is a great bargain. Website design in: Brisbane, Eildon Hill, Grange, Mt Ommaney, Richlands, Upper Mt Gravatt, Woolloongabba and surrounding areas.